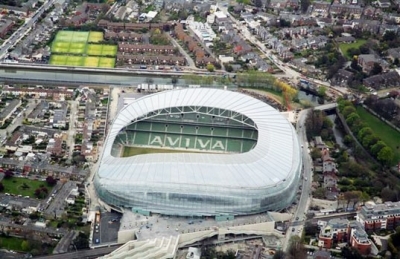 The new stadium being built in Dublin, Ireland, to replace the Lansdowne Road stadium. The first rugby match at Aviva Stadium will be a Leinster Ulster team against a Munster Connacht team on 7th August 2010. Map showing the location of Aviva Stadium in Ireland. Please explain the complete over cost. Somebody did very well for themselves. Triple the cost of the millennium and smaller and wetter. 50k perfect size for great atmosphere.80k too big for rugby. classic case of ireland sellin itself short! its too small and doesnt look great! 50 is big enough, adds to the atmosphere, but the name? What were they thinking. Are we Irish or Latino? Its not small, 50K is more than enough. You have the ability to request en edit to any of the details of Aviva Stadium. You can do this by clicking on one of the options below.